Market Rasen MP Sir Edward Leigh has launched a stinging attack on the town’s railway service, describing it as ‘hopeless’. And, in a surprise outburst, the Conservative stalwart hit out at the Government for investing in projects like HS2, instead of supporting rural rail lines. This comes after the Government has committed to spending £50billion on HS2 which will feature 250mph trains from London to Birmingham and later to Manchester and Leeds. Sir Edward Leigh said: “I’ve been campaigning for better trains for years. “The service here is hopeless and it’s one of the reasons why I oppose HS2. Sir Edward went on to reveal details of his own experiences on East Midlands Trains. He added: “Once, coming from Newark, I could barely get on the train. “We want two carriage trains and we want a regular service to Lincoln – and to Newark. Sir Edward’s views were backed by residents who also called for more carriages and a more frequent service. One said: “Bigger trains are needed sometimes. “One carriage is not enough, especially at weekends when lots of people want to use them. Another resident added: “Recently, my brother wanted to come from Rasen to Lincoln by train. The comp any says the service from Market Rasen to Lincoln has eight trains Monday-Friday, seven on Saturday and three on Summer Sundays. 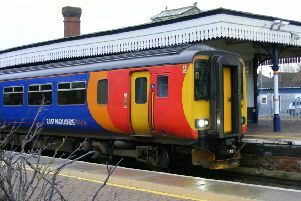 An EMT spokesperson said: “We have worked hard to provide the maximum possible capacity with the number of trains made available by the Government for the East Midlands Trains franchise, and have been successful in securing extra carriages for the parts of our network where they are needed the most. “ For example, passengers in Lincolnshire are now benefitting from extra services and quicker journeys to Nottingham, following the improvements made to our timetable in May as a result of partnership working with local MPs and councils.